Text and Photos: Yoshito Maeoka The concept of the memorial started via an appeal of journalist Lea Rosh in 1988. Finally, after numerous discussions and discourse, it opened this year. Guenter Grass and Christa Wolf, well known throughout the world entered their name as supporters of the concept. 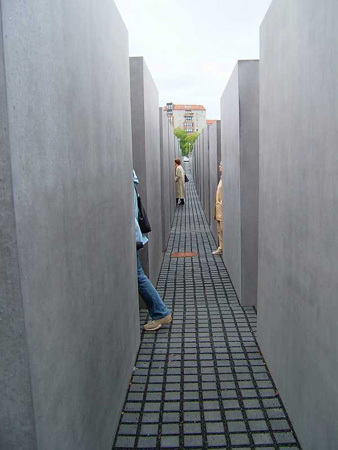 The Memorial, designed by Peter Eisenman, consists of open space for a multitude of stone monuments and an information center located underneath of the ground. The open space is composed of 2711 stone monuments. It is said that the number was calculated according to the location’s size, and that the number itself does not have any specific meanings. All stones are 0.95 meters by 2.38 meters and made of concrete with a hollow inside. Spaces between each stones are constant, just about the size of a person or a wheelchair can pass through without difficulty. Visitors are able to get in the area from many different points and walk through the space between the stone monuments. The height of the stones located near the open space are below one meter. As one keeps walking further, they gradually increase in height and the tallest ones exceed four meters. Eventually, only the exit and the sky can be seen as one walks towards the center of the area. The interesting thing is that there are no spots to create shadows. The stones look as if they are standing in a perfect line, in constant order, but actually they lean slightly and have varying heights. The ground is gently sloped. People show up in between the gaps in the stones and then vanish. Sometimes, you may bump up against somebody who is crossing the same time as you. The modeling is very simple and minimal. A structure like this reminds people of tracing history in various ways. The information center underneath the ground displays photographs, texts, and data. It looks at the Nazi extermination policies and records of the Jewish people. The exhibit portrays the history of the Jews as well. By tracing the time before and after their persecution, it shows some of the views of history brought about by the affair. Now, there is one question here. Is the Memorial dedicated only for Jews? During the Holocaust period the Jews were not the only victims. The Sinti and Roma, homosexuals and political criminals were also killed. Actually, the German federal council has already decided to construct memorials for them in different ways. The important fact here is to recognize the historical responsibility of the Germany that committed the crime of nearly wiping out the entire European Jewish population. Understanding other aspects of history will be accomplished in different ways. The Memorial is located in the center of Berlin. In the neighborhood, there are many tourism spots, such as the Brandenburg Gate, Hotel Adlon and the Reichstag Parliament Building. It also neighbors embassies of many countries, cultural facilities, offices, residences, and the Park of Tiergarten. This shows that the Memorial is open for the society. Not only Germans but also many tourists will visit here in the near future, and it will be one of the most important historical heritages in the world.